If you’re looking for adventure, Whistler, British Columbia is the place to go. There are so many options from hiking to mountain biking to ziplining. My loyal readers know how often I hang out with my parents – they’re basically my favorite people – so it’s probably know surprise that I tagged along on their vacation. My dad wanted to go ziplining and my mom is afraid of heights, so I very happily accepted the invitation to go adventuring in the northwest. Whistler is known for its wintertime skiing and summertime mountain biking but what it should be known for is its delicious, fresh seafood. August is a welcome time to escape the Texas heat and enjoy the cool mountain air (we needed jackets in August, something a Texan like me can hardly fathom) and an array of seafood. The best part about Whistler is that you can eat like a racehorse and still come home five pounds lighter. Pan Pacific Mountainside is in a great location in the village, close to everything and a short jaunt to Village North. It also has a delicious Irish restaurant, Dubh Linn Gate, which you know I appreciated. Araxi is one of my top five favorite restaurants in the world. If I could fly in this January to have my birthday dinner there, I would. I’ve been dreaming about returning since first experiencing Araxi in 2012. After spending five hours on an airplane and over two hours traveling from Vancouver to Whistler (which is a total event thanks to the gorgeous Sea to Sky Highway), we were ready to stretch our legs in the village and nosh on some seafood. 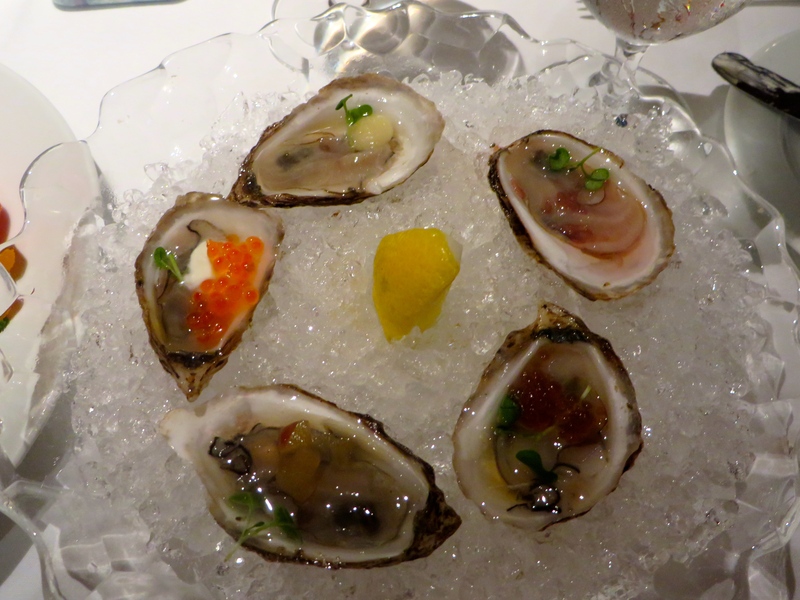 We started with Beausoleil oysters with pomegranate juice, fresh horseradish from a local farm, and lemon juice. I’m not a horseradish person but paired with cool pomegranate juice, it was something divine. The real show stopper here though was the dungeness crab in an egg roll crepe. You read that correctly. It’s like sushi but wrapped in a crepe instead of rice. It blew our minds. Fresh crab wrapped with avocado, citrus mayo, and smoked salmon, I think this might be my dad’s favorite dish ever. Mom in fact said, “This is the best thing I ever ate.” Our charming server from Montreal, Louie, was right when he said it was not to be missed. For dinner, I chose the fresh corn and prawn risotto, which tasted like sunshine in the summertime. I also added scallops because are scallops ever a bad idea? The scallops were perfectly cooked and complemented the dish beautifully. Mom ordered the salmon nicoise salad, which I thoroughly analyzed so I can recreate it at home. The soft boiled hen egg, anchovies, and olive mousse really put it over the top. It was so delicious that when we (*spoiler alert*) returned to Araxi later in the week, Dad ordered it. Dad chose the grilled red tuna with shitake mushrooms in a dashi broth, which was reminiscent of miso soup. He was extremely happy with his choice. For dessert, we ordered the chocolate caramel tort. Mom said, “It would be a shame to come here and not get this!” Layers of chocolate genoise cake, dark chocolate mousse, and dulce de leche are topped with orange-scented marshmallows and a dusting of chocolate streusel. The clearly handmade marshmallows could have been the whole dessert and I still would have loved it. Dad and I ziplined in Whistler together on a family vacation in 2012. We did the basic Bear tour and had a phenomenal time. So much so that he hasn’t stopped talking about it since. This time we decided to try to the Ziptrek Eagle Tour, which is a step up from Bear. The photo above is the very first line of the tour. I couldn’t believe how fast it went! I took videos but am having trouble uploading them. I’ll edit this blog later and add the video if I can. Now you all know where I get it from. Here’s my dad hanging upside down on the zipline. 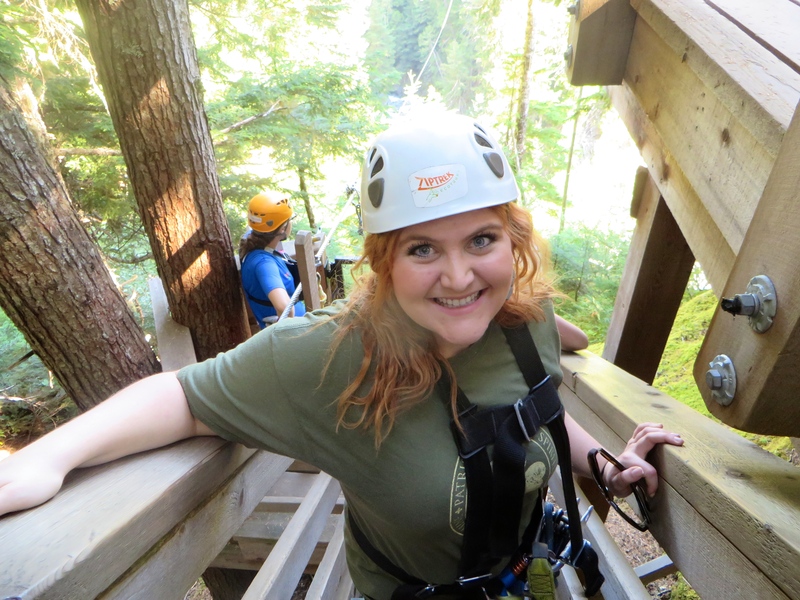 Part of the fun isn’t just flying through the air, it’s hiking through the forest and crossing suspension bridges. The whole tour lasts about three hours and includes five different lines. We had the best group on our tour and thoroughly enjoyed their company. Zipping back down to Whistler Village. We had the best luck: turns out the weekly farmers market is held on Wednesday afternoon! Plan accordingly. It’s not to be missed. We were a little dismayed that we had just stuffed ourselves with fish and chips because there were so many delicious options. If only I had the space in my suitcase for maple EVERYTHING. Not only is it the thing to get in Canada, it’s also one of my favorite flavors. You can pretty much find maple anything in Canada. I highly recommend a jar of maple butter. Yum. How adorable are these farmers? I really should have stopped and had a chat with them. After wandering around Upper Village, we returned to the main village for a cappuccino. Not a bad spot for a cap, right? Mogul’s is a local coffee shop a stone’s throw away from Araxi. It had quite a long line, which is how you know a place is good. Go where the locals go! I dream about Cow’s Ice Cream when I’m in Texas. You might remember me raving about it in my Lake Louise post. The first store opened on Prince Edward Island and it’s hand’s down my favorite ice cream. The butterfat content is super high and it’s churned slowly so it’s unbelievably creamy. If you find yourself in Canada, for Heaven’s sake, find the nearest Cow’s and get two scoops. This is not the time to save calories. This is the time to savor every single bite. Hiking to Nairn Falls was a treat. The valet suggested it when we told him we were on our way to drive around Pemberton. About a twenty minute hike through the woods along a river, the path is narrow but absolutely dream-like. To me, anyway. We don’t exactly have forests and rivers in DFW! If there’s one insider tip you take away from this blog, it should be to go to Blackbird Bakery. Dad wanted a snack after our hike so when we made it to Pemberton and saw a crowded bakery, he immediately pulled over. That’s probably the best travel tip I’ve learned from my dad: if a place has hardly any parking, pull over. It’s delicious. A box full of pastries. Yep, we ate one pastry in the shop and then promptly got up and got a BOX full of pastries: breakfast for the next day and cookies for that afternoon. I cannot say enough good things about these pastries, specifically the danishes. The outside is puffy and flaky, the inside is soft and creamy, and the raspberries are northwest fresh. If I could have a box shipped to me every Sunday, I would. Why mess with success? We had dinner reservations at Aura in Nita Lake Lodge for Thursday night but ended up having lunch at another restaurant inside Nita Lake Lodge earlier that day and were not impressed. The cauliflower soup was great but our salads were subpar at best. So we promptly cancelled our dinner reservations and went back to Araxi for more seafood. We all had fantastic jumbo prawns to start. I chose two small plates for my dinner: burrata and heirloom tomato salad and oysters five ways (creme fraiche and trout caviar, raspberry mignonette, elderflower infused apples, ponzu pearls and roasted lemon ice), which completely inspired me to up my oyster game at home. After a fairly light dinner, we walked over to Cow’s because you really ought to squeeze it in as much as possible while in Canada. Whistler’s Peak to Peak Gondola is a must. It’s the world’s longest unsupported span in the world and the highest lift of its kind. It’s a nearly three mile ride between Whistler Mountain and Blackcomb Mountain with breathtaking views. There’s hiking trails on both mountains and once you buy the lift pass, you can go back and forth as many times as you’d like. We had the gondola to ourselves on the way over! This guy waits for you on Blackcomb Mountain. It’s an inukshuk, a stone statue in the shape of a human that means “someone was here” and/or “you are on the right path.” It’s also a fantastic photo op. Christmas card, anyone? Blackcomb Mountain has surprisingly good lunch options for you at the lodge. This salmon sandwich was delicious! You pretty much can’t wrong with seafood in British Columbia. I’m happy to report that I spotted a black bear from the chairlift quite some ways away! Never lacking for words (as you can see by this novel of a blog post), I managed only to blurt our, “BEAR!” before whipping my camera out. I’ve been to Canada three times now and have seen black bears while on chairlifts all three trips. On our last night, we enjoyed 21 Steps. (If you go, get a cocktail. They have great ones.) I ordered the rockfish which came with black beans and rice pilaf. It was nice and healthy. We walked around the village a bit before heading over to Whistler Presents Outdoor Concert Series, where 91 year-old Dal Richards and his band rocked the Olympic Plaza with swing music. Until we meet again, Whistler! Maybe someday I’ll see you in the wintertime. Don’t forget to like The Rose Table on Facebook! 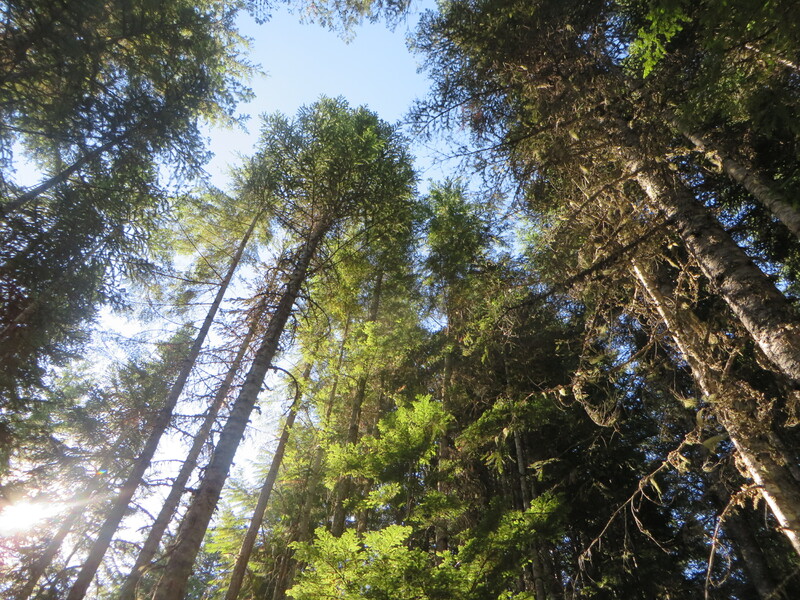 Rose- thank you for such an informative blog on your recent trip to BC. I found it entertaining and delightful. I have forward your blog to 5 different family members. … all foodies & travelers! Thank you, Maxine! I appreciate you forwarding my blog along. 🙂 I love connecting with foodies. Have you been to BC before? Thank you for taking me along on your great trip. Have to say you have beautiful eyes n your father scared me on the zipliner….wow! You were so informative, certainly no questions to ask. Thank you so much for your kind words, Nancy! I’m glad you enjoyed the article. I adore Whistler and hope to go back soon!